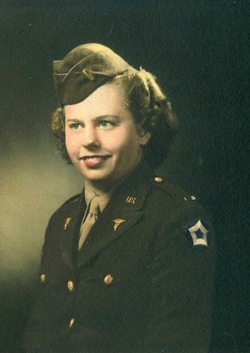 Neoma was the eldest sister in a large group of siblings, 5 of whom served in the armed forces during WWII. Neoma and her sister, Millie, attended nursing school together at Vincennes University in Indiana. When WWII broke out in 1941, they both wanted to join the Army. However, their father asked them not to join. He said he had 3 sons fighting in the war and he did not want his daughters sent overseas, too. As a concession to their father, the sisters continued to work as private duty nurses, providing care to patients in Indianapolis and Chicago. Shortly after the death of their father in January 1944, the Army again put out a call for nurses. The two sisters joined the U.S. Army Nurses Corps that same year, with the understanding by the Army that they would always be stationed together. There was a greater need in the Army at that time for nurses to remain stateside instead of overseas, so Neoma and Millie served together at various military hospitals in the country, caring for the wounded who were returning from Europe and the Pacific. It was at a military hospital outside of St. Louis, MO. where Neoma would meet her future husband, George Miller. In early 1946, George was one of her patients, and was undergoing treatment for his injuries. When George was transferred to Letterman hospital in San Francisco, the two sisters managed to arrange for their own transfer to the same hospital. This was the first time Neoma had ever been to California, and she knew then she wanted to live in the golden state when she left the Army. George and Neoma were married in November, 1946 with Millie and her future husband, Mike Wuhrmann, in attendance. In 1947, Neoma and George were honorably discharged from the Army. They made their way to the Long Beach area, where Neoma found work as a nurse for a local medical group. She would remain working for the same doctor for 27 years. In 1957, when Millie's husband Mike passed, Millie purchased the home on Schroll Street in Lakewood, next door to Neoma and George. The two sisters were together again sharing their lives and raising their daughters. My mother was honored to have served her country and felt privileged to have provided care and comfort to the men who sacrificed so much and asked so little in return. Neoma Miller and her husband George were among the original homeowners of Lakewood. They purchased their new home on Schroll Street in the Carson Park section in 1952. Neoma would spend the next 52 years in that home, working locally as a nurse, attending art classes at Long Beach City College and spending time with family.